We’d love your help. Let us know what’s wrong with this preview of Confessions of a French Baker by Peter Mayle. To ask other readers questions about Confessions of a French Baker, please sign up. This is a great little book that Peter made with the bread baker in his previous books. It is purse size, contains recipes, and I just wish it was longer! A nice little book for the bus. For this read I going to my local (not French but as best as I can do in Winnipeg) baker to get some bread I can munch on while reading. I love baking, I just have not baked a lot of bread. More of a cookie, muffin, squares baker am I. The introduction is a quick read and several of the recipes look delicious but I am in grad school in the heat of Manitoba. To cook or to graduate? Yep, another day, another time in my life I will have a home that smells of a French bakery. For now, I shall return For this read I going to my local (not French but as best as I can do in Winnipeg) baker to get some bread I can munch on while reading. I love baking, I just have not baked a lot of bread. More of a cookie, muffin, squares baker am I. The introduction is a quick read and several of the recipes look delicious but I am in grad school in the heat of Manitoba. To cook or to graduate? Yep, another day, another time in my life I will have a home that smells of a French bakery. For now, I shall return the book and head to the local french bakery to be a patisserie snob (I lived in Belgium as a pre-teen, I know my pastries). Gérard Auzet je pekařem v provensálském Cavaillonu a v této útlé knize vám společně s Maylem ukáže, jak se peče pravý francouzský chléb, bulka či bageta. Zvlášť se věnuje i přísadám a fíglům, které zaručí, že svůj pekařský výtvor nezkazíte. Recepty propojuje s historií své rodiny, příslovími a historkami. Tymiánový, meruňkový, slaninový nebo cibulový chléb – zaručeně dostanete chuť na všechny! Not much substance here, but the recipes are handy for reference. Did I mention that I'm a baker? I reread this recently after returning from an international baker's exposition in Paris where I witnessed a very wide variety of breads, many of which were a delight to the senses. For someone new to baking bread, there are plenty of handy tips in this book. But for professional or semi-professional bakers with plenty of experience at the art, there's probably nothing new. Nonetheless, it's a fun r Not much substance here, but the recipes are handy for reference. Nonetheless, it's a fun read. When asked what my "dream job" would be, my stock answer is a baker somewhere in the mountains of France - making bread in the morning and skiing, hiking or biking in the afternoons. Peter Mayle and Gerard Auzet's descriptions of life in a small-town French bakery were a perfect read for me. I only wish it were longer - it's a brief little book, and half of it is giver over to recipes. I would've liked much more than just the single day Mayle spends in the bakery. If you actually want to bake bread, this would be a good book for you. But I mostly just wanted to go behind the scenes of Provencal boulangeries without having to actually work. I got some of that wish satisfied, but not as much as I'd hoped. I imagine it would be fun to try the recipes--I just lack ambition for that right now. I'm not sure what the confessions actually are, but the good news is there are several recipes that look promising. What did I get out of this book? To bake bread you need to know how to count to 56! That is the magic number in Celcius for temperature in your kitchen + temperature of the flour + temperature of the water ! Meaning if your kitchen is at 20C and your flour at 22C then you will need your water to be at 14C ! For the perfect bread ! I wasn't expecting this to be a recipe book, but it was still interesting. Thus starts my quest to learn how to bake good bread! Well - if this is the start - then it's a quick one! This book hardly counts ... small, double lined and lots of pictures!!!! It certainly sounds easy, but like all things I'm sure practise 'bakes' perfect! hahahha! Sorry - personal enjoyment of puns there. I've yet to try the recipes but will give it a go. My biggest worry is finding a draft free spot in my kitchen ... so I'm setting up the blame for that when all fails! But I am determined to Thus starts my quest to learn how to bake good bread! I swear, while reading this book, I could smell the bread baking, hear the crust breaking and taste it melting in my mouth (food is so pornographic no?). And anything that makes a lazy person like moi want to BAKE BREAD WITHOUT A MACHINE can't be that bad...although I haven't actually baked anything yet, the ingredients look simple enough. When school ends and I have more time to spend 5 hours attempting to fashion a loaf, I will update and hopefully the 5 stars remain 5 stars. Peter Mayle is so excellent describing the world around him. Especially food and wine. This book is primarily a cookbook of bread, so there wasn't as much discussion on taste and experience as I wanted. The recipes seem sound and practical. The book could have easily been expanded with more stories - as is, I read it in about 40 minutes. Thankful I checked it out of the library instead of purchasing it. From the author who brought us A Year in Provence comes a small yet impactful book detailing the secrets of French bakers. Gerard Auzet is a friend of Peter’s who has been making bread since he was a boy. In fact, his family has been making bread in the countryside of Provence for several generations. This book is a must-read for all bakers and for anyone who has enjoyed the sheer pleasure of authentic French bread and baguettes. 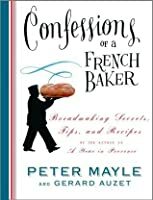 Peter Mayle was already one of my favorite travel writers but this little book provides a different side - an inside look at the amount of work behind those wonderful french baguettes and patisseries. The baguette recipe in this book is truly incredible. A quick, cute read with lots of great recipes! I really want to try making a baguette and garlic bread and BACON BREAD now. I had some garlic bacon bread in Paris - now if only I could get a recipe for that...I suppose I could just merge the two in here. This wasn't much of a book, really but the descriptions really took me back to France and made me miss the bread there dearly. A quick book about French bread baking. Short glimpses of a multigenerational family of Provencal bakers in expected Mayle style. Then, recipes and techniques for making your own.Some different detail than my other bread books, some different recipes to try. Later. Probably starting with winemaker's bread - flavored with red wine and several different types of nuts. Gerard Auzet asked Peter Mayle to write this short book as a souvenir for those who made the pilgrimage to his famous bakery in Provence. It's a fun little diversion, with recipes for those so inclined. A very short book of the author's experiences with a famous French bread baker. The value of the book is in the recipes and baking instructions that follow. I withheld rating the book until I tried a recipe; it turned out rather poorly, but I blame myself for that. I'll try again soon. Was expecting more of a story about the bread makers themselves, and their rich family history, so that was a bit disappointing. That said, the recipes look doable, as if the intermediate home cook can make them. Note I said intermediate, not novice! Another cookbook that doesn't include metric measurements. I don't know ounces and not about to learn. A few good tips and some great descriptions, but not a book to add to your cookbook collection if you have good bread baking books there already. Short sweet manual on making happy food - breads! May give it another star the day I start trying out some of the recipe. Few easy tips about baking like a French. Even just reading this I could smell freshly baked baguettes. I hope I can manage follow the tips to bake this fabulous french baguettes.